Does anyone else see the irony that on the very same day that the IPL was making enticing cricketers from all over the world to play in India for untold riches, the BCCI was also banning 30 young English players from learning cricket at the Global Cricket School in Pune? Further irony that it was the Pune Warriors who topped the spending list at $2.5 million for just four players; including Michael Clarke and one of Australia’s up and coming quick bowlers Kane Richardson. The BCCI is nothing if not contradictory. This is a truly special episode of throwing all toys out of the pram, subtler, if no less pathetic, than Inzaman Ul-Haq threatening a spectator with his bat after being called a potato. The Indians have complained that the Elite Performance Program (EPP) which ran alongside the Test series with England last winter was ‘unsanctioned’. In a match the EPP played, Joe Root scored 166 - the innings which pushed him up the pecking order leading to his assured debut in Nagpur, while Steven Finn was able to prove his fitness. It is worth mentioning, that the BCCI ban their own players from playing County Cricket in England, which may go some way to explaining the 4-0 whitewash last time they toured these Isles, and are now pissed off that the experience gained by our younger players contributed to them losing a series at home as well. I can’t argue, it almost certainly did contribute to their defeat. The confidence alone Root would have taken from that 166 would have surely played a part in his subsequent success, but is it right to take it out on the next crop of youngsters from Yorkshire, Durham, Kent, Hampshire, Glamorgan, Gloucestershire and Nottinghamshire? In fairness, I’ve heard English voices dissent at such situations in the not-so-distant-past. A letter in this months Cricketer Magazine came from someone in a grump about Rob Quiney signing for Essex this summer (should we really be worried about Rob Quiney? ), while the same happened when Phil Hughes came to Middlesex before the last Ashes series (he lasted two Tests). 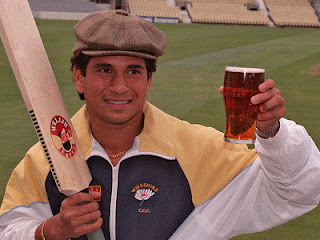 The difference being that the English County system has welcomed overseas players forever, even Sachin Tendulkar has played here in the past – and I’m pretty sure that Anil Kumble, Harbhajan Singh, Zaheer Khan, Rahul Dravid and VVS Laxman would all agree that their experience with English counties was worthwhile. Pretty strong list of names that isn’t it? Perhaps if some of the current crop of players were allowed over here they might improve too. The fact is that the world game is supposed to encourage development all over. The BCCI of course could not possibly do something like put the interests of the world game first could it? These young players you see, will not bring any cash into their coffers. Kevin Pietersen of course, with his star quality, they will welcome with open arms. No matter, the players will just go to Sri Lanka to learn their trade instead.